Variable Data Printing (VDP) is a form of digital printing in which elements such as text, graphics, and images can be changed from one printed piece to the next using key data points to create a personal experience for the recipient. How does this work and how can you maximize the data you have to create more effective print marketing campaigns? Using the example of a fictitious ice cream shop, discover the steps necessary to create personalized content for your consumers. 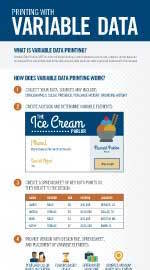 Download this infographic to find out exactly how variable data printing works!